I have a confession to make. I am NOT a fan of vampires. They've always grossed me out, what with the whole drinking blood thing. 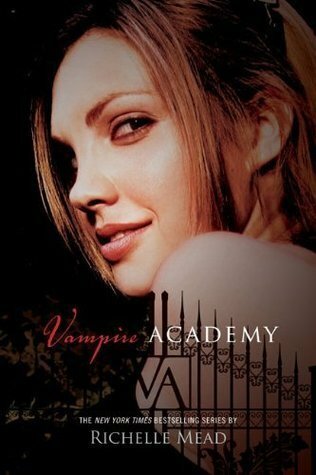 I usually tend to stay away from books where the main focus is on vampires, but I'd read so many gushing reviews for Vampire Academy. So with great trepidation, I started reading it. And...I actually liked it. *waits a moment for that to sink in* In fact, I liked it so much that I've already got the second book from my library and I will definitely be finishing this series (and perhaps even reading the Bloodlines series too). Mead's writing is certainly addicting, and she has a knack for storytelling. There's a bit more drama and a bit less action than I'd expected in Vampire Academy. Still, this didn't really affect my enjoyment too badly. The drama actually plays an important role in the plot, and ends up making the story flow really well. I really liked the balance; it was paranormal with a slight contemporary feel. And there's certainly plenty of twists and action at the end. Oh the characters. I think Lissa (Rose's best friend) was my favorite. I love how complicated her character is; it's such a brilliant cross between light and dark. Lissa is naturally very sweet and kindhearted, but there's such great character development as her new powers develop and it changes her whole attitude. Then there's Rose - I liked her pretty well. She's sassy, unafraid, hilarious, and sticks up for her friends. The love interest, Dimitri, is okay. I was rooting for Rose and Dimitri to end up together, but while I liked him, I just didn't love him. Maybe he'll get better in the later books. So overall, I was surprised by how much I enjoyed this. Perhaps it's not completely unique as far as paranormal novels go, but it's certainly thrilling and fun. And I wasn't even terribly disgusted by the vampires drinking blood thing - yay! I'll definitely be reading the sequel soon, and I'm especially excited now for the movie coming out in February!